Autumn is such a vibrant time in Sonoma Wine Country, with endless opportunities to savor hikes in the colorful parks and vineyards showcasing the golden fall season. Even the Sonoma Coast shows fall colors, with bluff sides carpeted in flowers and grasses. There’s a sort of secret attraction at this sprawling park, with the Environmental Discovery Center and its Science Saturday walks every first Saturday of the month throughout the year. The guided hikes offer interactive education on Sonoma County's plants, animals and natural resources through exhibits inviting us to touch, climb, crawl and play. Our region’s ocean front wonders are showcased, including a tide pool with live, touchable sea creatures like Shelby the turtle, while naturalist-led family hikes explore the landscape and wildlife of the mountains through the park. Look to the future, too, as experts share secrets of the earth and atmosphere, exposing delights like biodiversity in action, and the how man can help protect the planet. Work up an appetite for a great local seafood lunch on this easy hiking trail that edges three miles around the headlands, or the even easier one-mile path to and from the overlook. You’ll be rewarded with spectacular views of the Pacific Ocean, Bodega Harbor, and the town itself. It's a popular spot for whale watching during the migration season. To get there: Take coastal Highway 1, just past the town of Bodega Bay. Turn left on Eastshore Road, then right on Bay Flat Road. Go around the harbor and turn right at Campbell Cove, then head uphill, bearing right at the fork for the free parking lot by the cliff. Downtown Sonoma is framed against a beautiful hillside backdrop, and you can explore that hillside on the Sonoma Overlook Trail, a gently graded path that winds its way up the hill. At the top it loops around a meadow, providing spectacular views of the town of Sonoma, the Sonoma Valley, and (on a clear day) the Bay Area. The main trail is slightly less than three miles round trip. (Dog, bikes, and horses are not allowed on the trail.) Download the Overlook Trail brochure. There’s an offshoot trail that leads to the adjacent Montini Open Space Preserve, which also offers relatively easy trails with beautiful views. 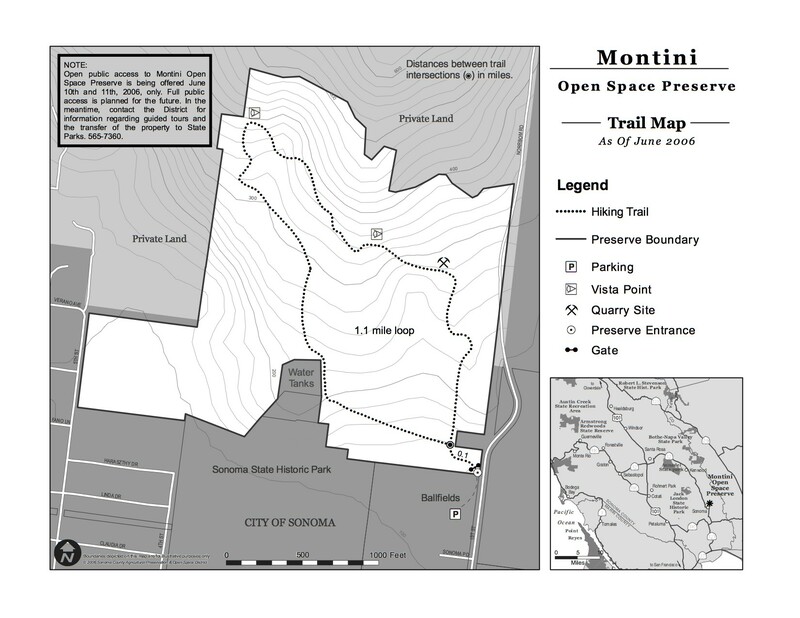 Download a Montini Trail Map and a trail map showing both Sonoma Overlook and Montini trails. Details: The main Sonoma Overlook trailhead is next to the entrance to Mountain Cemetery (four blocks north of the Sonoma Plaza off First Street West); and an upper trailhead takes off from Toyon Road within Mountain Cemetery. Note: The main trailhead and lower trail is closed for repairs in winter 2019, but the upper trailhead remains open and continues to provide access to the top of the hill. This is a true jewel, taking you on wilderness trails past Jack’s historic cottage, burned out castle ruins, and up into the high mountains thick with redwoods and sunny meadows. The surrounding Preserve boasts the tallest peak in the Southern Mayacamas Mountain Range, plus trails lined with creeks, wildflowers and meadows. So explore 1,750 acres of wilderness, and if you’re in good shape, trek to the top vista, where, on a clear day, you can see the Golden Gate Bridge from Gunsight Rock and Valley View Trail. The 820-acre park and preserve is one of the newest additions to Sonoma County's park system, and offers sweeping views of the county, unveiling autumn vineyards and trees ablaze in color as far as the eye can see. Take the 3.7-mile section of the Sonoma Mountain Bay Area Ridge Trail, which begins in the ferns and redwoods on the south fork of Matanzas Creek, then winding through dense groves of oaks and bay laurels. This sprawling park offers extraordinary leaf-peeping, with the shimmering red-yellow foliage of Big Leaf maples lining the creeks next to amber-leaf oaks spreading like a velvet drape along the hillsides. Crunch your boots through fallen leaves along the trails, warmed by the sun dappling through the branches, and pause to take in the beauty of the 72-acre tree-lined lake. The oasis spans 805-acres, in lush groves of 500 to 2,000 year-old trees towering to 350 feet (that’s taller than a football field is long). Breathe deep and savor the velvety quiet and solitude; the massive trees are often shrouded in mystical fog with swords of sunlight piercing through. For one of the easiest ways to navigate, take the mile-and-a-half long round trip Pioneer Nature Trail over mostly flat terrain. Tip: Dogs are not allowed on trails, though they can join you in the developed picnic areas. Some two decades of planning and $21 million in spending paid off in early 2013, as the 1,100-acre Taylor Mountain Regional Park and Open Space Preserve finally opened to the public. Debuting with four miles of trails for hikers and dogs plus a three-mile network for equestrians and cyclists, trails are being expanded to 17 miles. It joins the 820-acres of preserves that have been open since 2010, capped by a peak soaring 1,400 feet-high for dramatic views of downtown Santa Rosa, plus Bennett Valley, Annadel State Park, the Mayacamas Mountains to the east and the whole of the Santa Rosa Plain viewable from the trails. You’ll thrill to this spectacular stretch of Jenner just north of Bodega Bay. As one of the most easily accessible sandy beaches tucked amid the towering bluffs and crashing waves, the partial cove is also a superb area for wildlife watching, where the Russian River meets the sea. Hike the trails around the high surrounding cliffs to watch migrating gray whales, or claim a prime perch on the beach, which is home to a colony of frolicking harbor seals. The “Sonoma County Vineyard Adventures” program is operated by the Sonoma County Winegrowers for free, no-appointment needed, self-guided vineyard tours available year-round. Not only do you get to stroll among the vines, but you’ll see up-close how they’re pruned and what the different varietals look like. When you visit one of the participating wineries, start by stopping in the tasting room to pick up a detailed walking-tour guide to the vineyard. The trails are no more than a mile long and relatively easy to walk, and points of interest will be clearly marked along the route. You can always finish up with a nice wine tasting afterwards, too. Find more info about outdoor activities in Sonoma County here.